In 1956, a crew of four sailors, led by Henri Beaudout, and two kittens set out to cross the North Atlantic on a raft made from little more than nine telephone poles and two kilometres of rope. In 1956, a crew of four sailors, led by Henri Beaudout, and two kittens set out to cross the North Atlantic on a raft made from little more than nine telephone poles and two kilometres of rope. 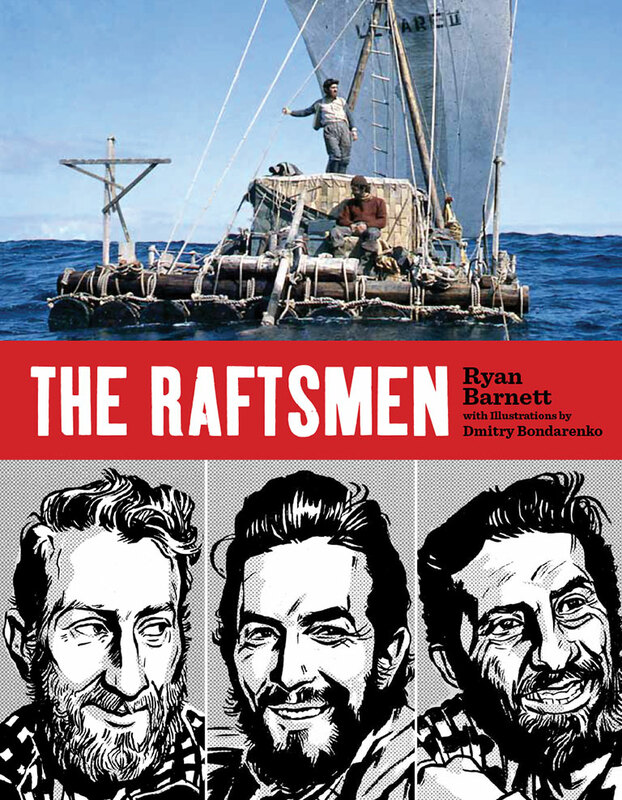 This extraordinary adventure, reminiscent of Thor Heyerdahl’s 1947 Kon-Tiki expedition, is portrayed in Ryan Barnett’s The Raftsmen. Barnett, a documentary filmmaker and producer at Historica, teamed up with Canadian artist and illustrator Dmitry Bondarenko to tell this fascinating true-adventure tale. Using a blend of archival photography and artwork interwoven with narrative comics, Barnett and Bondarenko engage readers with a rich and emotionally charged account of this long-overlooked voyage. The story begins with an ex-soldier-turned- draftsman who convinces a crew of novice sailors to brave the dangerous waters of the North Atlantic to test his theory about ocean currents. It also tells of Second World War exploits that moulded the personalities of the brave sailors who risked life and limb for the spirit of adventure and science. The Raftsmen brings all the excitement of a television docudrama to the printed page through beautifully illustrated maps and sequentially illustrated accounts of major challenges during the voyage. This colourful and entertaining book is suitable for younger readers as well as for adults. Book Review: Even with my interest in natural history, I didn’t expect to find this five-hundred-plus-page tome all that engaging, given the dry title. Yet I found myself drawn in to Wetherell’s accessible, sometimes-passionate, always measured writing style.